Another piece of disturbing news came from the Census Bureau yesterday. In its annual report, Income, Poverty and Health Insurance Coverage in the United States 2009, to the Congress, the Census Bureau said that the worst recession since the Great Depression has pushed millions of Americans into poverty. According to the report, the poverty rate was at 14.3% in 2009, which translates to a total of 43.6 million people ,or 1 in every 7 Americans, living in poverty, up from 39.8 million, or 13.2%, in 2008. The annual increase of poverty rate from between 2008 and 2009 was the second largest on record since 1973. 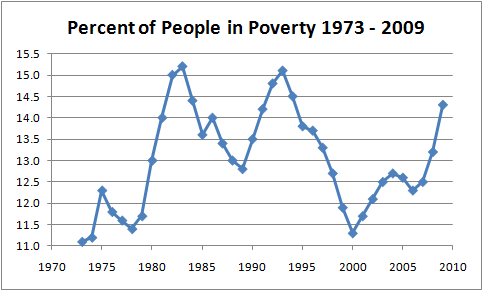 Only the increase between 1979 and 1980 was higher. As you can see from the figure blow, the 14.3% poverty rate is the highest since 1994 when the percentage of people living in poor was 14.5%. The definition of poverty in 2009 was a pre-tax income of $10,830 for an adult or $22,050 for a family of four. 2009 was the last year when the survey was conducted. With unemployment hovering around 10% most of 2010, the picture could be even gloomier in the 2010 report. The Census report also showed the number of people without health insurance increased to 50.7 million in 2009 from 46.3 million a year earlier, leaving 16.7% of the population without health care coverage.